Whether or not Islamist terrorists prove capable of executing another attack on the United States on the scale of the strikes of September 11, 2001, we would be foolish to assume they can’t. The desire remains, while the bloodlust and the passion have only intensified. The willingness to sacrifice their lives to do us harm is indisputable. We are more vigilant and—somewhat—less willfully naïve, and grand attacks on the homeland are harder to stage today, but the price of deterrence is high in economic costs, resources, and diverted energies. Even failed attacks trigger expensive, long-term responses. Whichever side we may judge as winning the violent confrontation, the terrorists continue to score impressive economic victories. One largely ignored cause of our economic doldrums has been the diversion of funds, public and private, to security since 9/11. Security costs are dead weight on an economy, money diverted irrecoverably from wealth-generating endeavors. Even when we don’t bleed red, we’re bleeding green. We have immense reserves of physical and financial power, but the Islamists have strength of will, clarity of purpose, and rigor that dwarf our own. In a contest of raw power, we would win (were crippling restrictions on how we fight rescinded), but in the contest of wills—already under way—we have been thrust onto the strategic and moral defensive (and further into deficit spending). In another sphere in which we logically should dominate, that of innovation, we’re also losing badly. If there is any single factor that should alarm us, it is the ferocious brilliance of our enemies. They use our laws, our technologies, our customs, even our freedoms against us. They work cheap, operating with the austerity of the guerrilla, but with global reach. We must defend everywhere. They can attack anywhere. With seemingly casual remarks from the ramparts of the Red Fort, Prime Minister Narendra Modi has changed the political template in Balochistan and Jammu & Kashmir, both on the Indian side and in the territory occupied by Pakistan in 1947-48 in defiance of international law and the directives and resolutions of the United Nations. The new strategy, first articulated at an all-party meeting on Kashmir on August 12, means that New Delhi has crossed the rubicon, smashing the decades-old paradigm of Indian foreign policy, viz., to ignore the Pakistani annexation of Balochistan (March 27, 1948) and downplay its occupation of roughly one-third of the erstwhile kingdom of Jammu & Kashmir which acceded to India on October 26, 1947. Regardless of the pace at which events now unfold in Balochistan, Gilgit Baltistan and so-called Azad Kashmir, Modi has sent multiple signals to the international community. For Beijing, the message is simple: The One Belt One Road (now called Belt & Road) from Xinjiang through Gilgit Baltistan, Balochistan, and on to Gwadar Port, will only be viable with Indian agency, as New Delhi alone is trusted by the native populations. Former Afghanistan President Hamid Karzai’s unequivocal support to Modi’s speech underlines the goodwill and trust for India in Pakistan’s penumbra. Despite the claims of a new TV show, these teams aren't routine paratroopers: they are an elite strike force. On Independence Day, the television channel Discovery India has launched a new show on how India’s paratroopers are made. The trailer of India’s Paratroopers – Earning the Badge is meant to inspire awe about the prowess of the men who go through an intense six months of gruelling probation to make the cut. There’s just one problem with the video: the men shown in it are not paratroopers. They belong to the Special Forces units who, although a part of the Indian Army’s Parachute Regiment, were never paratroopers to begin with. At the heart of this grand obfuscation lies a tragic tale of a forcible marriage and the abuse of a much-cherished nomenclature that has haunted India’s military capabilities for decades. Discovery India’sinability to distinguish the Special Forces from the routine paratroopers furthers that deliberate attempt to obliterate identities, which are detrimental to the rich legacy and history of India’s Special Forces. Discovery India did not respond to Scroll.in’s requests for a clarification. Play ‘India’s Paratroopers – Earning the Badge’. When President Obama issued yet another statement regarding Afghanistan on July 6th,and once again delayed his plans to cut the number of U.S. troops in Afghanistan, he took action that had already become almost inevitable. Even though he had announced his plan to cut U.S. troop levels to 5,500 by the end of 2016 less than a month earlier, a level of only 5,500 troops risked critically weakening Afghan forces and probably losing the war. Keeping the level at 8,400, however, is at best a half measure in meeting Afghanistan’s real needs. The United States needs a far more serious review of its strategy in Afghanistan. It needs a conditions-based military strategy that stops focusing on trying to keep deadlines for withdrawal and on total U.S. troop levels, but instead focuses on what it takes to deal with the facts on the ground in Afghanistan and actually win. It needs a strategy that can build sustained public and Congressional support, and provide a proper legacy for the next president. It needs a strategy that can at least try to avoid making Afghanistan an unnecessary pawn in the bitter presidential campaign and to give the Afghans a clear incentive to make critical reforms. At the same time, the United States needs a strategy that fully recognizes that counterinsurgency warfare has a civil dimension as important as the military one. If the U.S. needs to provide military support that reflects the actual state of conditions in the war, it also needs to impose “conditionality” on an Afghan government and political structure that has kept Afghanistan as the equivalent of a corrupt failed state. Indeed, the host country regime the U.S. and its allies are seeking to protect has become as much of a threat to creating a meaningful outcome to the fighting as the Taliban and other declared enemies. A new report by the CSIS Burke Chair in Strategy provides a detailed analysis of these forces and capabilities, and is available on the CSIS website at https://csis-prod.s3.amazonaws.com/s3fs-public/publication/160819_Chinese_Space_Strategy_Developments.pdf. Developing more advanced programs is a key aspect of China’s military modernization efforts. Any assessment of China’s goals and program in space must be considered within the broader framework of its other substantial military reforms which all represent a move towards fighting modern “informationized” wars. “Informatization” has been doctrinally enshrined by the PLA since 1993 and arose from PLA strategists after observing what they believed to be paradigm shifting success of U.S. forces during the 1991 Gulf War. How the tech vanguard turned public-key cryptography into one of the most potent political ideas of the 21st century. This article is an excerpt from “Rise of the Machines: A Cybernetic History” by Thomas Rid (copyright © 2016 by Thomas Rid). The original text has around 100 footnotes that have been removed in this version. This excerpt was published with permission from the publisher, W. W. Norton & Company, Inc. All rights reserved. Prime Minister Narendra Modi has made a statement on Pakistan-occupied Kashmir (PoK) and expressed his concerns about the state of human rights there. The government as well as the establishment in Pakistan has issued statements about the turmoil in the Kashmir Valley. The people on both sides of the Line of Control (LoC) in Jammu & Kashmir (J&K) have demanded undivided attention from their respective governments during the past few months. Against this backdrop developments on both sides of the LoC require critical study and analysis. An attempt is being made here to understand these developments and suggest some policy alternatives. The recent elections in PoK or Western Jammu and Kashmir, consisting of both Gilgit Baltistan (GB) and the so-called “Azad Jammu and Kashmir”, which is under the occupation of Pakistan, resulted in the overthrow of incumbent governments led by the local chapters of the Pakistan Peoples’ Party (PPP) and their replacement by governments led by local units of the party ruling in Islamabad — the Pakistan Muslim League-Nawaz (PML-N). By now, familiar charges of rigging have been made and protests have ensued in both regions of PoK. Although the PPP was, in a way, reconciled to its defeat in G-B, it is crying hoarse about the results in so-called ‘AJK’. The ballot took place under strict supervision of the Pakistan Army and, therefore, the allegations reflect the familiar trend in Pakistan— that the party or parties losing the electoral battle have always been bad losers. The election in ‘AJK’ took place under the shadow of turmoil in Srinagar Valley over the death of a Kashmiri youth who had started advocating armed struggle. Before this incident as well as after it, the opposition parties had started raising the ante on ‘Kashmir’ and a lot of anti-India sentiments was stirred especially by the young and inexperienced PPP leader, Bilawal Bhutto. He had started raising the temperature on the ‘Kashmir’ issue by levelling allegations that Nawaz Sharif’s government is pandering to India and especially Prime Minister Modi, The slogan that PPP supporters raised in ‘AJK’ was—“Modi ka yaar, gaddar, gaddar” (“He who is Modi’s friend is a traitor”). Over the past several months, media reports have made it seem like Russia’s influence is growing in the Middle East. After all, Russian air support helped Syrian President Bashar al-Assad’s regime regain the upper hand against the rebels in Syria. Then, Turkey suddenly and intensely moved to improve ties with Russia – at a time when Turkish-American relations have deteriorated. Finally, and most recently, Russian strategic bombers conductedairstrikes in Syria after taking off from an Iranian air base. Today, however, the serious geopolitical constraints that Russia faces in expanding its influence in the Middle East became quite apparent. The Kremlin’s Foreign Ministry spokeswoman said that Russia and Turkey remained at odds over Syria. Turkish Justice Minister Bekir Bozdağ said that anyone who accuses Turkey of aiding the Islamic State – which Moscow has done quite loudly – is an enemy. Elsewhere, within days of allowing Russian aircraft to take off from one of its bases, Iran rescinded the permission. Defense Minister Hossein Dehghan accused Russia of a “betrayal of trust” for publicizing the deal. These different but definitive signs underscore how uncomfortable Turkey and Iran are with getting too close to Russia. Russia and Iran are on the same side as far as Syria is concerned. They are the principal allies of the Syrian regime and cooperate closely to ensure that Assad remains in power. Tehran and Moscow also have very close bilateral relations in a number of fields. Russia has helped Iran on the international front with regards to the latter’s controversial nuclear program. The Beginning of Change of Approach? Is there a change in the approach of the Government of India on dealing with the present wave of unrest in Kashmir which has held the Valley in a state of enforced stasis since 8 July? While at the All Party Meeting on 12 August, Prime Minister Narendra Modi talked of pain for those killed in the Valley the overall sense appeared to be of a security dominant approach. The Prime Minister’s mention of role of Pakistan in the Valley and also human rights violations in Balochistan indicated that there was an attempt at diversion which however did not directly addressthe mood of anger in Kashmir. In a meeting with delegation of leaders from J&K Opposition Parties on 22 August however the Prime Minister seemed to have changed tack to mention the need for dialogue to find a permanent and lasting solution to the Kashmir problem within the Constitution. There was neither any mention of a role of Pakistan nor other digressions including Balochistan thus indicating that the focus of the dialogue was on looking through talks. The Prime Minister also appealed for Political Parties to reach out to the people and convey concerns of the leadership and expressed his commitment to the development of the State and its people. Since the toppling of the Taliban government in 2001, India and Afghanistan have witnessed a significant strengthening of their bilateral ties. As Afghanistan’s stability is important for India’s own, New Delhi has readily supported the growth of democracy in its neighbour, battered as it is by many years of conflict and instability. This paper maps out the nature of India’s relationship with Afghanistan, focusing on the two nations’ economic, political and social engagement. It studies Afghanistan’s present security situation and how its future is hinged to a considerable degree on Kabul’s relationship with the US, Pakistan and China. The paper builds on themes discussed during the ‘Afghanistan-India Relations: A Way Forward’ conference organised by the Observer Research Foundation with Friedrich Ebert Stiftung on 28-29 March 2016. The year 2015 was a crucial one for the National Unity Government (NUG) of Afghanistan: it faced a resurgent Taliban, even as it led a major international push to seek peace negotiations with the insurgent group. Since the formation of the NUG in September 2014, President Ashraf Ghani has made it his government’s priority to bring the Taliban to the negotiating table, reaching out to Pakistan to court its influence. However, the Taliban’s blanket rejection of peace talks — and, in a punctuation to such rebuff, its violent offensive — have resulted in the deterioration of the country’s security situation. President Ghani, it seems, is left with little to show for more than 18 months in office. It is in the context of the Taliban conflict, and the daunting task ahead of finding peace and stability in Afghanistan, that its relations with India must be viewed. Afghanistan and India have maintained close historical and friendly ties over many decades. In December 2015, Indian Prime Minister Narendra Modi’s visit to Afghanistan was looked at by Afghans in a favourable manner. During that same visit, PM Modi delivered a speech before Parliament, calling on Afghans to vote in the elections and encouraging the people to participate in their country’s democratic processes. It was a heartening development that built even greater goodwill between the leaders of both countries. Afghan security personnel prepare for combat during an ongoing battle with Taliban militants in the Nad Ali district of Helmand earlier this month. More than a hundred US troops have been sent to Lashkar Gah to help prevent theTaliban from overrunning the capital of Afghanistan’s Helmand province, in what is thought to be the first US deployment to the embattled city since foreign troops withdrew in 2014. Since late July, the Taliban have seized new territory across Helmand, defying a series of about 30 US airstrikes, and raising concern of an attack on the capital. The militants have also stepped up attacks in the country’s north, closing in on Kunduz, which they briefly captured last year. Myanmar State Counselor Aung San Suu Kyi concluded her visit to China on Sunday. After her China tour last year, The Nikkei published an article arguing that if Suu Kyi is in power, India's position in Myanmar's diplomacy will outweigh China, and Myanmar may shift its diplomatic focus from its east side to west. Suu Kyi's latest formal visit, the first outside ASEANafter her taking office, shows that China seems to be more significant than India in Myanmar's diplomacy. Yet in June, Suu Kyi expressed her wish to visit India during her meeting with V.K. Singh, India minister of state for external affairs. Suu Kyi has chosen China for her first overseas trip outside ASEAN probably not because she is emotionally close to Beijing, but out of Myanmar's domestic politics and national interests. She will lead the country to seek a balance among major powers. Like China, India is one of few countries that kept a close relationship with the Myanmese government during the military rule. Yet Suu Kyi was never a fan of New Delhi's dual-track policy - supporting democratic forces and meanwhile having close ties with the military junta. She believes that India, the largest democratic country in the world, should not have kept a distance from Myanmar's democratic forces during the latter's democratization. The ties between Myanmar and India are full of peculiarity, complexity, and versatility due to historical connections. As they face problems including border disputes, cross-border ethnic minorities and Indians in Myanmar, their relations have been far from smooth. But for Myanmar, enhancing ties with India can help counterbalance China's influence in Myanmar and also develop its economy by using Indian investment. A Westerner with extensive on-the-ground experience in Syria and Iraq tackles conventional Western views of the civil wars in Iraq and Syria and proposes a dramatic rethinking of the region. I was not surprised to see my first article greeted with so much outrage by those who adhere to the conventional Western narrative of the civil wars in Iraq and Syria as well as the larger tumult of the Middle East. In truth, these conflicts are not so easily defined by the easy sectarian narrative offered in the Western press. I argued that Western elites were surrendering to and even embracing the Saudi definition of what Sunni identity should mean. And I provided accounts of the conflicts in Syria and Iraq that do not comport with what you likely have been reading in the newspapers. Editor’s Note: Welcome to the fourth installment in our new series, “Course Correction,” which features adapted articles from the Cato Institute’s recently released book, Our Foreign Policy Choices: Rethinking America’s Global Role. The articles in this series challenge the existing bipartisan foreign policy consensus and offer a different path. Objectively speaking, the hazard posed by terrorism to the United States is popularly perceived to be far more dangerous than it actually is. Regardless of the statistics and facts, public fears persist at high levels, impelling political posturing and irresponsible policymaking. Even including the 9/11 attacks (which proved to be an aberration, not a harbinger), an American’s chance of being killed within the United States by a terrorist of any motivation over the last few decades is about one in four million per year. For industrial accidents, it’s one in 53,000, homicides, one in 22,000, auto accidents, one in 8,200. Since 9/11, an American’s chance of being killed by an Islamist terrorist is about one in 40 million per year. There was great alarm, of course, in the wake of 9/11, when the intelligence community was certain that an even more destructive “second-wave” attack was imminent and when it informed reporters that between 2,000 and 5,000 trained al-Qaeda operatives were on the loose in the United States. The world needs to acknowledge that it needs immigrants, but immigrants also need to understand that they need to assimilate in a society in order to benefit from it. Nothing stops them from observing their culture or religion even while integrating themselves with their host nation. Both cultures benefit from this deal which promotes syncretism and compromise. German Chancellor Angela Merkel’s party— the Christian Democratic Union (CDU)— is moving towards greater policing of immigrants, surveillance of public areas and a partial ban on women wearing the face veil in some public spaces. ACNN report quoted German Interior Minister Thomas de Maiziere as saying that “full-face veils” are not on, adding, for good measure, that the ban may include “not just the burkha (but) any full face veils that only shows the eyes of a person.” The idea is to ban veils in places where identification is required – in registry offices, schools, government offices, while driving, etc. France banned the wearing of the Islamic niqab and burkhas and religious symbols in schools and public places some years ago— an action that has been upheld by the European human rights court. After the recent bout of jihadi outrages in several French cities, from Paris to Nice, several French cities have also banned the wearing of body suits while swimming, the “burkini” so-to-speak. America and the UK, with their multi-cultural backgrounds and different interpretations of secular rights, have not done so. But they are, in fact, moving towards curbing immigration itself, one more for economic reasons (Brexit) and the other for both economic and cultural reasons bordering on xenophobia. It’s going to be a long year for Lt. Gen. Stephen Townsend, who on Sunday became the seventh American general since 2003 to assume command of war operations in Iraq. And his mission might be the toughest one yet. As the head of Operation Inherent Resolve, Townsend’s objective is to eliminate the Islamic State’s self-proclaimed caliphate while simultaneously diffusing the region’s Sunni-Shia conflicts that have metastasized into a proxy war, drawing in nearly every major country across Europe and the Middle East. He has to win the Battle of Mosul and stabilize northern Iraq. He has to pursue ISIS into Syria, where the U.S. has few allies on the ground, and negotiate a highly complex battlefield that also includes heavily armed and highly unpredictable Russian military forces. And back in Washington, Townsend will face historic uncertainty, the product of an unusual political landscape that — for better or worse — will produce in a new commander in chief come January. Townsend replaces Lt. Gen. Sean McFarland, a fellow Army officer whose 11 months in command brought about a significant momentum shift. He helped the Iraqi army seize Ramadi and Fallujah, two strategically important cities in Anbar province, and made important commitments to the Kurdish forces now encroaching on Mosul from the north. That came despite a spike in ISIS terror attacks in Baghdad, turmoil inside Iraq’s Shiite-led government, and the steady expansion of Russian military operations across the region. Most recently, Russian military aircraft began flying combat missions from Iranian air bases, cutting across the Iraqi airspace already crowded with American military aircraft. Some 18 years ago, India and Pakistan conducted successive nuclear tests, joining China as Southern Asia’s three overt nuclear powers and transforming the region into a nuclear trilemma. Both India and Pakistan have developed their arsenals at a measured pace, at least compared to historical standards. Today, however, there are concerns that we could be witnessing a potential slow-moving, but cascading, arms competition in the region following China’sdeployment of multiple independently targetable re-entry vehicles (MIRVs), or multiple-warhead missiles, in 2015. In contrast to city-busting nuclear payloads sufficient to hold population centers at risk, MIRVs enable a single missile to carry several nuclear warheads, potentially to strike several distinct targets. MIRVs are particularly destabilizing because they enable the possessor state to target an adversary’s nuclear assets in a preemptive first strike. BERLIN – Europe is under pressure. Integrating asylum-seekers and other migrants – 1.1 million in Germany alone in 2015 – into European society poses a major challenge, one that has been complicated by a spike in crimes committed by new arrivals. Making matters worse, many European Muslims have become radicalized, with some heading to Iraq and Syria to fight under the banner of the so-called Islamic State, and others carrying out terror attacks at home. Add to that the often-incendiary nativist rhetoric of populist political leaders, and the dominant narrative in Europe is increasingly one of growing insecurity. Lone wolf terrorism is exceedingly difficult to detect and therefore prevent. The attackers are usually citizens of the country that they are attacking, so they cannot easily be traced or stopped at borders. They are able to carry out their attacks with readily available materials, from purchasing a gun to creating a rather simple bomb out of materials that can be bought at a hardware store with little suspicion. If a country wanted to eradicate lone wolf terrorism, it would need to completely eliminate the sale of goods such as guns, fireworks, nails, pressure cookers, lead pipes, Christmas lights, and matches. And even then, those committed to carrying out a lone attack would just have to get a little bit more creative or acquire the necessary materials on the black market. This paper focuses on radical Islamist lone wolf terror attacks, particularly those inspired by Al Qaeda and Daesh, which follow the pattern of attacks outlined in Al Qaeda’s “Open Source Jihad” in their magazine, Inspire. One of the greatest challenges when combatting and preventing radical Islamist lone wolf attacks is that it is a challenge of combatting ideology rather than a force of ground troops. Western powers fighting against radical Islamist terror organizations, can beat them back from territory, block their funding, and imprison all of their leaders, cutting them off from all outside communication, and still lone wolf terror attacks would occur. This is in part due to the lack of outside demand and hierarchy characteristic of lone wolf attacks. There is no chain of command through which to track these soldiers of leaderless jihad. There is no cable to be intercepted telling them where, when, and how to attack. This is self-directed terror in the name of a global ideological movement that is nearly impossible to track or identify until they strike. Hacking tools apparently purloined from the National Security Agency's cache of cyberweapons and dumped online this week raises troubling questions about the motives and means behind the attack. While some experts say more information and analysis is necessary to determine the origin or incentives of the leak by an anonymous group, many cybersecurity experts and former NSA employees are drawing a direct line back to Moscow. In fact, some say that exposing the agency's stockpile of custom-made malware is an effort to deter the US government from retaliating against Russia over the recent Democratic National Committee hack, which US officials and many technical experts have blamed on Kremlin operatives. A previously unknown group calling themselves the Shadow Brokers released the stockpile of top secret computer hacking tools and exploits that it claimed to have obtained from the Equation Group, the moniker for a group that many believe is actually the NSA. 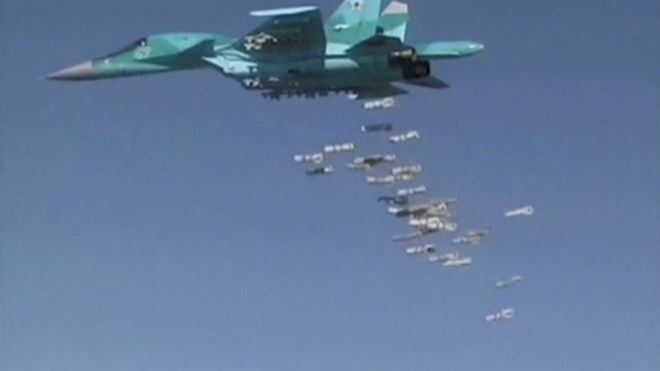 Russia has stopped using an Iranian airbase to bomb targets in Syria, both countries have said. Iranian foreign ministry spokesman Bahram Qasemi said the operation was "over for now" and the planes had gone. Iran's Defence Minister Hossein Deghan had earlier criticised Russia for publicising the raids last week, saying it had exhibited a "show-off" attitude. Russia for its part has confirmed that all of its planes used from Iran for Syria strikes are now back in Russia. Russia. like Iran, is a key ally of Syria's President Bashar al-Assad. Last Tuesday, Russia's defence ministry announced that Tupolev-22M3 long-range bombers and Sukhoi-34 strike fighters had used the Shahid Nojeh airbase near the western city of Hamedan to carry out air strikes on "terrorists" in Syria. The raids were the first carried by Russia from a third country since it began an air campaign against Mr Assad's opponents almost a year ago, and also the first launched from Iranian soil by a foreign military since World War Two. “We have somewhat solid data to support the notion that playing video games in fact actually improves your cognitive processes and your visual processes,” said Dr. Ray Perez, program manager at the Office of Naval Research’s Cognitive Science of Learning Program, in an interview with Task & Purpose. “Video game players are far superior to non-video game players in the ability to process things like field of vision, being able to hold digital objects in your memory. They can process information faster,” he added. And that’s where virtual and augmented reality come into play. Is the Shadow Brokers leak the latest in a series? Since August 13, the ShadowBrokers posted a manifesto and two large encrypted files onPastebin, on GitHub, on Tumblr and on DropBox (the latter three closed or deleted meanwhile). New document lays out plans for department-wide operating system, use of CACs, data center consolidation and migration to cloud services. The U.S. Defense Department unveiled Thursday a bold information technology and cybersecurity road map that modifies its approach on several efforts in the rapidly changing environments. The guide positions the department’s IT infrastructure and processes for a broad impact, in addition to hopes of greater security and scrutiny, said its chief information officer, Terry Halvorsen. Your Security Team is Outgunned: Where's the Help? Most experts believe the good guys continue to fall further behind in our global hacker wars. So how did we get to this point in cyberspace? Most important, where can you go for help in this new Wild West online? The implication was certainly yes — following the early WikiLeaks actions ofJulian Assange. Still sound familiar today? After an unknown group released a cache of hacking tools from the National Security Agency earlier this week, some of the biggest tech companies in the world are scrambling to patch their systems and software to protect themselves and customers from attacks. The leak came from the anonymous group calling itself the Shadow Brokers. While the group's origin and motivations remain unknown, cybersecurity experts and former agency employees have authenticated the cache of NSA hacking tools. By exposing the custom-made malware online, the Shadow Brokers have suddenly made many of the systems American corporations rely on for cybersecurity more vulnerable to digital attacks from criminals and spies. Now, many cybersecurity experts are asking why the NSA would stockpile so many of these kinds of security vulnerabilities without telling the affected companies such as networking giants Cisco and digital security firm Fortinet. The new rules reflect a shift in intel-gathering from phone-tapping to capturing conversations on the internet. A privacy update to 1982 Defense Department rules for conducting surveillance on Americans contains a loophole that lets the National Security Agency continue eavesdropping on a wide swath of online conversations, critics say. “DOD Manual 5240.01: Procedures Governing the Conduct ofDOD Intelligence Activities” was last issued when all email addresses could fit in a Parent Teacher Association-sized directory. The new rules reflect a shift in intelligence gathering from bugging an individual’s phone to netting communications in bulk from the global internet. The revision aims to address the reality that many, many conversations now occur online and should be shielded from government surveillance, intelligence and civil liberties experts agree. But the document creates a carveout that does not respect the privacy of data ferried along international communications wires, according to the New America Foundation’s Open Technology Institute. The new manual is “making kosher the kind of upstream collection that allows for really widescale incidental collection, even if very time-limited collection, of Americans’ information,” said Robyn Greene, the institute’s policy counsel. Unlike in the 1980s when transatlantic talk was cost-prohibitive (a 3-minute call between America and Western Europe cost up to $12.60), now the equivalent of several hundred Libraries of Congress worth of chatter traverses undersea cables everyday at a rate of a few cents per YouTube download.